Arc Agency Shows This Week! Sidewalk Dave Release Celebration on 9/15!! 3 of CT's best band's have come together and we at CTINDIE have put together a mini statewide "tour" to show you all what they have to offer. 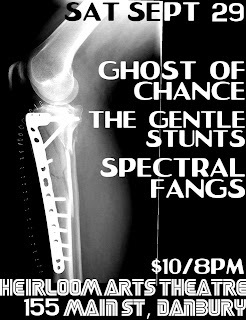 So watch out CT, because Ghost Of Chance, The Gentle Stunts and Spectral Fangs are headed your way! The final date is 9/29 @ The Heirloom Arts Theatre. This series of shows was inspired by constant listens to our summer mix D60 (which you may have seen popping up for free in CD and tape format at various shows across the state) wherein it became clear that these three bands, aside from being made up of the nicest chaps ever, sound REALLY good together. So much so that the thought came "these bands should play a show together" and somehow then turned into "these bands should play several shows together!" 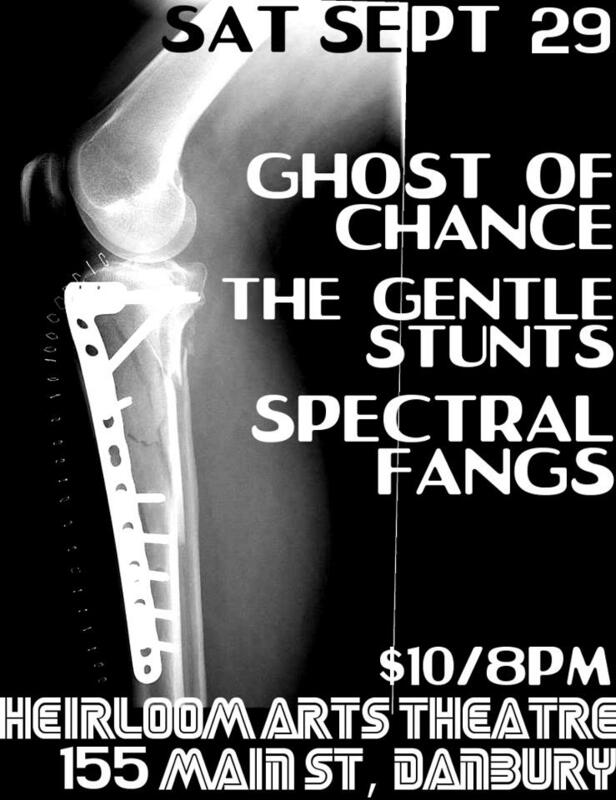 Ghost of Chance are an experimental rock band based in New Haven, Connecticut. The group's distinctive style is characterized by subtle time signature changes and sonically open experimentation set to surrealist lyrics. Ghost of Chance's sound takes its influence from 1960s psychedelica, '70s glam, math rock and post-punk while maintaining the shimmer of classic pop sensibilities. All of this adds to the unique yet familiar sound that Ghost of Chance have cleverly cultivated. Engaging the audience with a nervous energy and the desire to communicate, Ghost of Chance share a sense of imperativeness with great pop predecessors like the 13th Floor Elevators and John Cale -- sincerity combined with pop knowledge. The Gentle Stunts is a solo act with guest appearances from friends on various tracks. Over the past 2 years, I have begun to develop an insatiable love for writing and recording songs. I am 20 years old and am about to release my 2nd LP. I have dozens of other songs that surround my two albums, which have either not fit the mood or were a result of the growing pains that come with recording. He awakened from a dark dream in which he was a miniature vampire to find that the sunlight reflecting from his incisors made a rainbow spectrum across his bed chamber ceiling. That's where the name came from. Now the music, that's a different story. Drawing on his near 10 years experience as headmaster at a prestigious private school, he crafts songs about The Human League, and the difficulties they encountered during their rise to fame. Taking on a new identity as Spec Tralfangs and bringing in former students to fill his sound out, he is now ready to shake off the shackles of dreary New England life.